Toffee Bars look innocent enough. That is, until you bite into one. I find it hard to resist the combination of a buttery brown sugar shortbread, dark chocolate, and a sprinkling of toffee bits or finely chopped nuts. 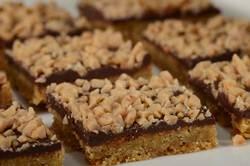 Some say that these Toffee Bars look, and even taste, like Buttercrunch Toffee. I will leave that up to you to decide. Like most bars and squares, Toffee Bars are easy to make and would be perfect for holiday baking as they will keep a couple of weeks in an airtight container, or they can be frozen. In fact, I find these bars only improve with age. They start with a shortbread base, and they contain the usual shortbread components, butter, sugar, vanilla, and flour. But brown sugar is used instead of white sugar, which gives the shortbread a lovely toffee-like flavor. The shortbread is baked until golden brown. Immediately upon removing from the oven, chocolate is sprinkled over the hot shortbread and then, just pop it back into the oven for a minute to melt the chocolate. You can use semi sweet, bittersweet or milk chocolate. And feel free to use either chocolate chips or chop up your favorite chocolate bar. Once the chocolate has completely melted, sprinkle on toffee bits or toasted and finely chopped almonds or pecans. You can leave the bars to set at room temperature or, to speed the process along, you can place them in the refrigerator until the chocolate hardens. As with most things chocolate, these do benefit from sitting at least overnight so the flavors have time to soften and mingle. Shortbread: Preheat oven to 350 degrees F (180 degrees C) and place oven rack in the center of the oven. Line the bottom and sides of an 8 inch (20 cm) square baking pan with aluminum foil. In a bowl whisk the flour with the salt. In the bowl of your electric mixer (or with a hand mixer), beat the butter and sugar until light and fluffy (2-3 minutes). Beat in the vanilla extract. Scrape down the sides of the bowl and then add the flour mixture, mixing only until incorporated. Spread the shortbread evenly on the bottom of the prepared pan and bake for about 20 minutes or until the shortbread is golden brown. Remove from oven and immediately scatter the chocolate chips over the hot shortbread. Return the shortbread to the oven for a minute or just until the chocolate softens. Remove from oven and, with an offset spatula or back of a spoon, evenly spread the chocolate. Sprinkle the toffee bits or chopped nuts over the chocolate. Place the pan on a wire rack to cool completely. Once the chocolate has set, lift the shortbread from the pan using the edges of the foil. Place on a cutting board and, with a sharp knife, cut into 16 squares. Store in an airtight container. These will keep for a couple of weeks at room temperature or in the refrigerator. They can also be frozen. Note: To toast the nuts. Place the nuts on a baking sheet and bake in a 350 degree F (180 degree C) oven for about 8 minutes, or until lightly browned. Let the nuts cool completely and then finely chop.